When the stress of big city life becomes overwhelming, residents of the Dallas-Fort Worth area know there is a relaxing place just up the road where they can get away and play. Conveniently located ten minutes north of DFW Airport along Interstate 35, Lewisville offers family-friendly attractions, inviting hotels, fun-filled outdoor areas, and the historic charm of Old Town Lewisville. Many of the buildings and homes that were built around the time Lewisville incorporated in 1925 are still standing today as official Lewisville landmarks. Old Town Lewisville is the best place to find many of them within walking distance of each other. Browse the specialty shops, grab a bite to eat at one of several themed restaurants, commune with nature in Wayne Ferguson Plaza, sample beer and spirits at the brewery and distillery, and catch a performance at a local theater. In fact, the Greater Lewisville Community Theatre operates out of the oldest building in Lewisville, built in 1885. Anchoring Old Town Lewisville is the performing arts center, MCL Grand. Throughout the year at the MCL Grand, audiences can enjoy Lewisville Lake Symphony concerts and world-class ballets performed by LakeCities Ballet. Popular offerings at the MCL Grand include the Texas Tunes Concert Series and the Black Box Songwriter Series. When it comes to having fun in town, Lewisville Lake is at the top of the list. With 233 miles of shoreline, you will find the right spot to launch your ideal outdoor adventure. 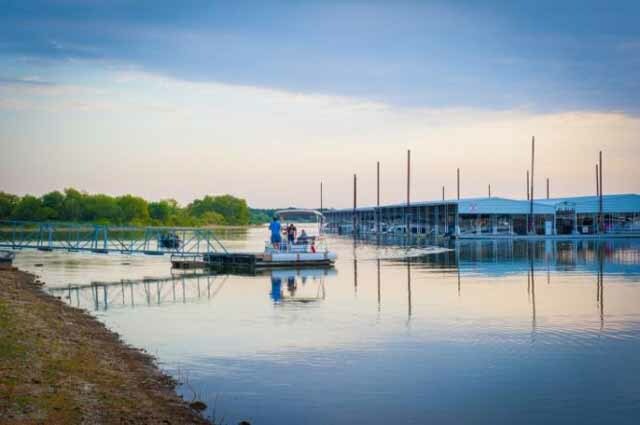 From fishing for bass at the Lewisville Fishing Barge and exploring the urban wilderness at LLELA, to having a picnic at Lewisville Lake Park and swimming at Sneaky Pete’s, this area offers something for everybody. Lewisville is a special getaway in the middle of everything!